Two posts in a day? Why of course! I have good news for you right now! I couldn't just put this on my Giveaway page. I had to tell you about it in a post, so you can hurry and enjoy the goodies! As the title says, Zoya nail polish and treatment now have new promos for 2012! Y'all know how much I love Zoya nail polishes by now. Aside from being 3-free, they are also really easy to apply on the nails, and dry in good timing. The variety of colors you can choose from is also a lovely bonus! Some of you have probably heard about Zoya's new polishes that are set to be released soon - The True and Flecks Collection. I am so excited about the flecks collection, and I can't wait to get my hands on them! Anyhoo, let's get to the more exciting thing. 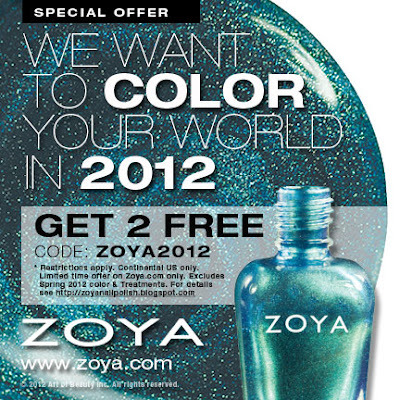 Get any* 2 bottles of Zoya Nail Polish for FREE on ZOYA.COM. All you pay is the standard shipping charges. 1. Add the 2 Zoya Nail Polishes that you want to try to your cart (as well as any additional merchandise that you would like). 2. Enter the code into the the coupon/promo field in the shopping cart and press the "Apply Code" button. This promotion is valid online only at www.zoya.com, www.qtica.com & www.artofbeauty.com in the United States only. Void where prohibited. Limit one promotion per account and household. We are not responsible for incorrect addresses and credit card entry errors. Please allow up to 4 weeks for shipping if volume warrants it. Not valid with any other coupons, codes or promotions. If you're not a fan of Zoya on Facebook, I say click HERE now so that you can get the promos as they're being released. If you're on Twitter, click HERE to follow Zoya. You can still view their updates on twitter if you don't have an account like me. What an UNREAL deal. I wish they shipped internationally to make is easier! Oh well...where there's a WILL there's a WAY!! Indeed my dear. Where there's a will, there's a way. Lol.. I sense you have ideas eh? Nice deal I so have to look into this! Thanks!